Ita��s that time again! We welcome a brand new year as we diligently list out our resolutions and promise to do better. Those same conversations are revisiteda��about how fast time flies a�� as we start making plans for the year ahead. 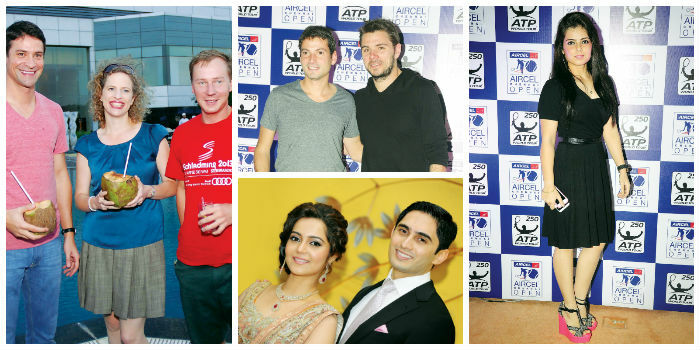 Making a splash on the annual Chennai calendar is the Chennai Open, bringing in 2014 in style. The fun begins a�� scrambling for tickets, trying to get good seats and hoping to meet our favourites this season. Of course, the action isna��t all court side, with multiple a�?prea�� and a�?posta�� match parties that just cana��t be missed. This year, the Hyatt Regency plays host to the tournament and the opening bash set the tone for the week ahead. We got to see players from across the years, and while the Amritraj brothers will always be Chennai favourites, eyes were also on younger player Yuki Bhambri and 2011 champion, Stanislas Wawrinka. The poolside venue was perfect for the sundowner party. The informal setting allowed for guests to chill and interact with this yearsa��players. My column wouldna��t be complete without a wedding, and tying the knot this season were Varun Acharya and Suraksha Bhatla. If youa��ve ever asked yourself, what do you get when an architect and a dentist get married, my answer would be, a�?a super fun weddinga��. Besides making the most adorable couple, the bride and groom brought with them an entire brigade of expat friends, who were more than happy to celebrate a�?desia��-style. It was great to catch up with them and recap the last few years. While Acharya is back from his training in the US, as a maxillofacial prosthodontist, Bhatla specialises in sustainable design. And no, we didna��t just talk shop, a large portion of the evening was spent on the dance floor. Touches of both the North and South were incorporated into the ceremonies and decor, making it a well rounded experience. And if our wedding and tennis related partying was not enough, just imagine what happens when auto-rickshaws get thrown into the mix. Also launching this week was the seventh edition of the Annual Rickshaw Challenge, a popular event among expats. Taking adventure travel to a whole other level, the competition shines the spotlight on Asiaa��s most beloved vehicle. Contestants seemed more than ready for the challenge and all set to get started. And on that note, herea��s wishing everyone an amazing New Year with loads of fun and adventure. Cheers!